This display service offers a modern and stylish approach to wall mounted graphic displays. The inter-changable textile graphics are fitted in to a slim aluminium frame and mounted on to the wall. Not help choosing the right frame? Just give our friendly team a call on: 01761 431300 or email us and we will be back in touch to help and advise you. The aluminium display frame is a brushed, anodised natural aluminium finish with a slim 18mm deep visible profile and a 28mm wide wall mounting profile. The display frames are held together with steel corner fittings. The visible viewing area of the textile display graphic is maxmimised with just a thin, 2mm aluminium frame showing from the front. This display graphic solution offers infintate flexibility - we can cut the aluminium display frames to your required size in a square or rectangular shape. Small sizes are achieveable, such as A4 (297mm x 210mm) right up to display frames that are 1500mm in height x almost any length. . 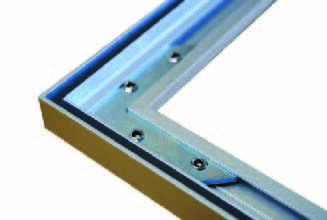 The aluminium display frames can either be supplied made up in their finished frame size or as individual elements to be easily fitted together on-site with the allen key provided. This second approach means that larger panel sizes can be supplied in a tube to save space and packing / transport costs. The graphics for these aluminium display frames are produced using digitally printed textiles, creating a vibrant colour print. The graphics are stitched with siliconne beads around the perimeter which fit in to slots in the aluminium display frame. This creates a smooth, tensioned, joint free graphic presentation. This graphic can remain in the display frame until you wish to display another image. We can print and produce another textile graphic to fit your frame and send it out to you. This is the ideal inter-changable graphic display system, as you can easily replace the original graphic, keep it and refit it later if required. One benefit of using textile graphics in these aluminium display frames is that they can be rolled up and posted in a tube to save distribution costs.